Bertie the gardener and his dog Oscar like their life, and their tatty old brown floppy hats too. They wear them everywhere. One day though, Bertie sees someone with a different type of hat, one that makes the guy look important, and he wants to look that way too, so he puts his brown floppy tatty one away and buys a bowler. He is soon dissatisfied when he seen another man looking dignified in a different type of hat, and buys one of those, and so it goes when he sees others in hats looking professional, clever, mysterious and magical, only to find when he wore the other hats, he didn't feel that way at all. 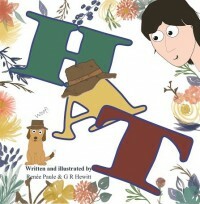 My grandson and I like this book-- beyond learning the names of different types of hats, it offered a profound lesson... that what is one the outside is not what makes a person what they are, but on the inside. It is an adorable book for kids! I received this book in exchange for an honest review-- thank you Renee!